We’ve been telling you a lot about SAP Lumira 2.0, including all of the new features and UX. As you can see from the videos and screen shots, the user experience is significantly improved. User experience is more than screen shots—it’s about optimizing workflows according to how people actually use the software. It’s way more than surface lipstick—which is why SAP invested heavily in the rapid prototyping and sharing scenarios. I know what you’re thinking: with all of these new features, maybe you need to wait for the product to stabilize before giving it a try. I get that, but you don’t need to wait. Why? Lumira 2 is using a very stable, established core. SAP BusinessObjects BI Platform has been around for a loooong time—15 years. It has been tuned for security, and scalability. Lumira 2 uses live data connectivity from SAP BusinessObjects Design Studio (now SAP Lumira Designer), which has been in the market for 4 years. It has unparalleled access to BW and HANA which has been tested and used in production for years and years. At the same time, we make use of the existing Lumira Velocity engine for acquired data use cases. In short we are using best of both existing technologies. Lumira 2 uses semantically-rich data models developed with BusinessObjects universes. The UNX universes have also been in the market for 26 years, and have proven their scalability. 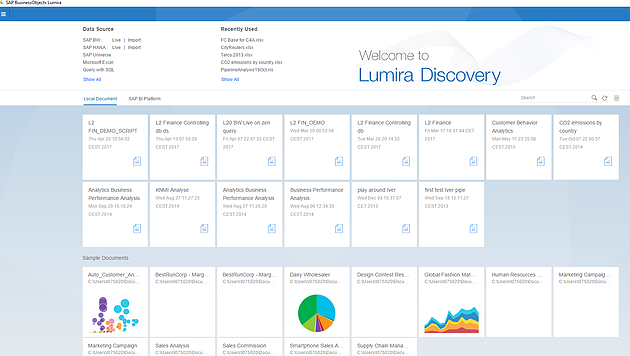 Lumira 2 uses the design principles from SAP Fiori, which has been in market for 4 years. Lumira 2 uses the application-building core of Lumira Designer (SAP BusinessObjects Design Studio), which, again, has been in market for 4 years. For those of you doing the math, that’s 49 cumulative years of technology behind this release. In addition to working on this stable, established core of technology, we have done extensive user testing with this release. Vetting with global user groups, influence councils (ASUG membership required), strategic advisory councils, and design councils. Hands-on testing, in complex enterprise environments with many customers during our Guided Beta phase with 30+ customers (now closed). More hands-on customer testing via our Early Adopter Care program (30+ customers), which resulted in some customers being Live in production already. EVEN MORE hands-on customer testing via our Open Beta program (40+ customers and growing, running now). Third-party performance testing of the servers for large amounts of data and user capacity (running now). This thing works. In real, complex business environments. Over 100 customers have hands-on tested and validated it so far. My message is this: have your cake and eat it, too. Get a ton of new features, new user workflows, and refined user experience WITH a stable, tested, reliable core. To learn more about SAP Lumira, read our data visualization handbook.